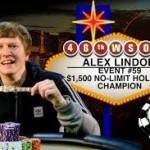 Alex Lindop, A British poker player has won $1,500 buy-in No Limit Hold’em championships at Event Number 59 of WSOP 2015 currently going on to the Vegas caesuras palace. Total 2,155 players were associated to play the game and out of total 2,155 entries 216 players got some prize as they were finishers to the event. The total amount of pool prize generated by all the entries was $2,909,250, whereas winning $531,037; Alex comes first and wins a Gold bracelet as well. This is the second time in the event/ tournament when a British player has won a gold bracelet for himself. The event was on the process to 29th June 2015 to 2 July 2015. Mr. Alex is a British origin professional poker player and a 25 year guy who love to gamble around at the best of the places and tournaments on the world. Till date he has been to the WSOP 4 times and won some cash. While this particular year of 2015 has brought luck for him. He made his final appearance for the first time and won first place as well with a gold bracelet. This makes the total WSOP earning for him up to $547,307 .In the year 2011 he came at 39th place of the same world series of poker tournament. The event was 59th out of total 68 gold bracelet events going on right now. Lindop was very happy after winning the shot for the life. He told reporters that he does not know that what is he going to do with this hugh money. This was the biggest career win for the Amex Lindop. 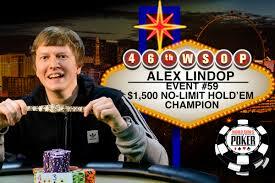 He has played at many European Poker tour and tournaments at the England and London.Lindop is a player who love to play Omaha, Omaha hi/lo and Hold’em games. The second prize winner of the event is Aurelien Guiglini, he is an online poker player from Paris and love to play No Limit games. Aurelien wins a total share of $330,578 for his bank account. Third prize for this particular event belongs to Yorane Kerignard, a player from France. He got his share of winning total to $229,787. Yorane also played at various EPT and World Poker tour and won a WPT as well.